This walking tour takes visitors around Jeong-dong, a neighborhood to the west of Deoksugung (Deoksu Palace), home to some of Seoul’s best architecture from the late 19th and early 20th centuries. Deoksugung traditionally served as a auxiliary palace but became a main palace in 1897 when King Gojong (the 26th king of the Joseon Dynasty) expanded it. It is unique among Korean palaces in having a modern seal engraving and a western style garden and fountain, thus mixing elements of medieval and modern architecture. The Changing of the Royal Guard can be seen in front of the palace's Daehanmun (Gate), and is a very popular event for many visitors. During the Joseon Dynasty, the royal guard was responsible for opening and closing the palace gate as well as patrolling around the gate area. 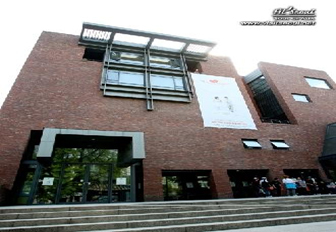 The Seoul Metropolitan Museum of Art (SeMA) opened in 1988 and has earned the reputation of being one of Korea’s leading art venues with a series of world-famous exhibitions. The beautiful Renaissance façade which forms the entrance to the museum was originally part of the Supreme Courthouse, built in 1928. Today it is better known as the iconic image of the Seoul Metropolitan Museum of Art. 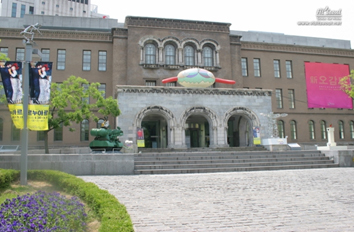 In March 2006, the arch and the beautifully constructed museum building were designated as Cultural Property No. 237 in recognition of their great historical and architectural value. The Paichai School was founded in 1885 by the American Christian missionary Henry Appenzeller after King Gojong denied his request to build a church. The eastern hall, built in 1916, was the first western-style school in Korea and is considered one of the country's best examples of missionary school architecture. Today it is the site of the Appenzeller/Noble Memorial Museum. Chungdong First Methodist Church is Korea’s first Protestant church, established in 1897 by American Methodist missionary Henry Appenzeller (1858-1902) who first introduced the Methodist Church into Korea. 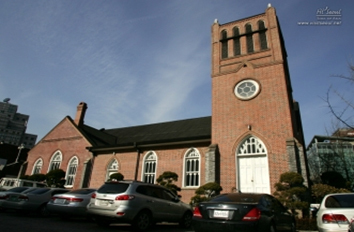 Known as Bethel Chapel in its early days, Chungdong First Methodist Church is the one and only 19th century church in the country. The church has great historical significance as the fountainhead of the “March First Movement” (one of the earliest public displays of Korean resistance during the Japanese occupation of Korea, which occurred on March 1st, 1919) as well as in the history of Christianity in Korea. It is designated as Historic Site No. 256. Jungmyeongjeon is the site where Western missionaries once lived until King Gojong decided to expand his palace compound (Deoksugung) in 1897. The new royal library became the palace’s first Western-style addition (but not its last). Tragically, Jungmyeongjeon is also the site where the king was forced to abdicate Korea’s foreign policy-making authority to Japan in 1905 and the Eulsa Treaty, one of the infamous unfair treaties forced on Korea by Japan, was signed. Simpson Hall was built in 1915, and is all that remains of the former Ewha Hakdang which was destroyed during the Korean War. Ewha Hakdang was founded in 1886 by American Methodist missionary Mary F. Scranton and the hall was named after Sarah J. Simpson who contributed the money to found the school. It was Korea's first school for women and the first South Korean university to be officially organized. The Sontag Hotel was Korea's first modern, Western-style hotel and was once a popular spot for Seoul’s early expat community. 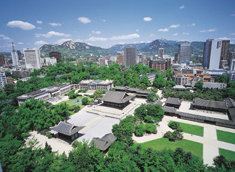 It was purchased by Ewha Hakdang in 1917 and renovated for their students. 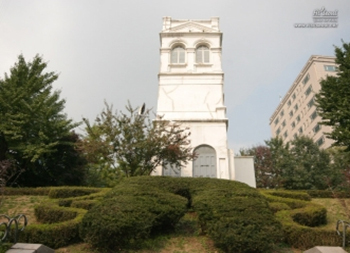 It is now the site of the Centennial Hall at Ewha Girls High School. The Russian Legation was originally built in 1890 and was connected to Deoksugung by a tunnel. King Gojong took refuge in the legation for some time after Japanese assassins murdered his wife, Queen Myeongseong. During the Korean War the building was destroyed, and all that is left of Russia's former hilltop legation is a beautiful white, Renaissance-style tower.